Imagine a machine which accepts CAD drawings, then produces a three dimensional prototype within a few hours for $100 - it now exists. The successful implementation of the technology points the way to this technology eventually finding its way into local bureau which produce while-you-wait samples as a service, and eventually to the home where designs could be downloaded from the internet and manifested at whim. American Z Corporation now has several models of 3D printers that produce physical prototypes quickly, easily, and inexpensively from computer-aided design (CAD) and other digital data. In the same way that conventional desktop printers provide computer users with a paper output of their documents, Z Corp.'s 3D printers provide 3D CAD users a physical prototype of real world objects such as a mobile phone, an engine manifold, or a camera. The process operates in a remarkably similar fashion to the ink-jet printer, building layer upon layer of powder and a bonding agent which creates the object, and it can even be done in full colour. Though only available for a short time, the machines have already found their way into the world's best known R&D studios - Sony, Fisher-Price, Adidas, Canon, Kodak, NASA, Harley Davidson, Lockheed Martin, Northrop Grumman, BMW, Porsche, Ford, DaimlerChrysler, Harvard, MIT and Yale.At the bottom end of the market, the most recent entry-level rapid prototyping system from Zcorp sells for around US$25,000 providing customers with an all-purpose solution for their modeling needs. 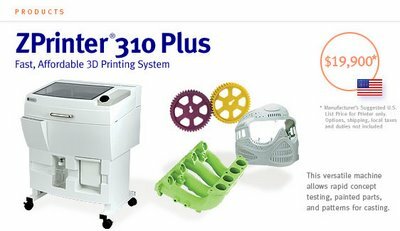 The ZPrinter System completes the Z Corp. 3D Printer product line, which includes the Z406 Full Color 3D Printer and the Z810 Large Format 3D Printer. Z Corporation offers a range of materials to support its 3D Printers, including the new ZCast powder, used to create molds for metal casting on the Z Corp. 3D Printing Systems. Z Corp.'s revolutionary ZCast technology addresses the needs of the metal casting industry and end users who seek to rapidly produce metal prototype parts. The ZCast technology involves printing metal casting molds directly from digital data. The process drastically reduces the time it takes to produce a casting from weeks to days. 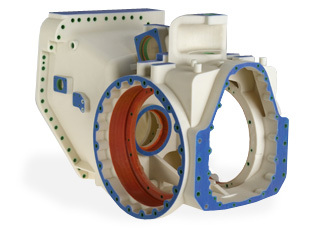 In addition to the ZCast process, the Z Corp. technology can be used to create patterns for the sand casting or investment casting of metal parts. I am not sure whether you guys knows about RP (Rapid Prototype) products. I had some experiences of using such kind of high tech machine before, reasons: it is quick and cheapest way to make a Design prototypes for presentation use. Recently, the RP machines technologies has been improving very well, where you will spend less money and output quality is a lot better than before, moreover it also can be printed with colors nowadays. What do you think if we buy one of these machines and run a prototype making business company? Tell me your opinions.